When you think of a home that is unsafe, you may think of doors and windows that do not lock or homes in bad neighborhoods. You may not think about mold growing in the home, which can quietly grow from room to room without you noticing. If you worry that your home may be growing mold, then you should act by checking every room in the house for signs starting in the areas where mold flourishes. Signs that your home is growing mold starts with how you feel. If when you are at home you feel sick but you feel better when you leave, then you may live in an environment that breeds mold. If you notice suspicious stains or wall damage, then you may be sharing your home with toxic mold. Mold is not only gross in appearance, but it can also cause serious health problems. Therefore, you should follow the below list of signs that can help determine if you have mold growing in your home. 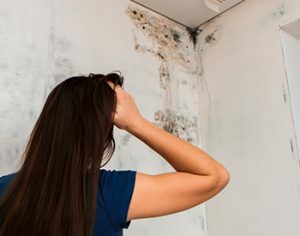 One of the first signs that you have mold growing in your home is if you notice a musty smell since mold emits an odor that smells stale and musty. If you notice this smell in specific rooms in your house but not in every room, then it is likely that mold is present in the room in which you smell it. Once you follow the smell to where it is the strongest, you will need to remove it, either on your own or professionally. Even if you smell mold but you do not see it, it is highly possible that your home is infested with mold. Usually, a moldy smell is the only evidence homeowners have that their home is growing mold. Therefore, you must act as soon as you smell mold since it means that a health risk may be present. Toxic black mold is detrimental to the respiratory system and can lead to a chronic cough. Other symptoms of mold in the home include shortness in breath, sinus congestion and severe allergies. If you have lung disease or immune suppression, then you are at risk of contracting a fungal infection caused by the mold growing in your home. If someone who lives in your house has a chronic cough, then you should have your home checked immediately for mold. It is common for people to be allergic to toxic mold. Meaning, that if any members of your family break out in severe rashes, then they may be reacting to the mold inside the home. Additional symptoms include swelling and irritation of the skin and occasionally hives. As you may have noticed, your health is a strong indicator that you have mold in your home. If you have mold allergies, you may dismiss them as seasonal or household allergies, or as the common cold, since they carry many of the same symptoms. These symptoms include watery eyes, sneezing, running nose, headaches, dizziness, and memory loss. If you notice that you only show the above symptoms when you are in your home, then you may want to get your house checked for mold. Since many forms of mold are toxic, your symptoms can continue to worsen until the mold is removed from your home. If you have toxic mold growing in your home, then you may have problems concentrating or show signs of memory loss. Since toxic mold can affect the brain, it is a reliable indicator that there is mold in your home. Additional signs of mold include you feeling fatigued, sluggish and weak. If you seem only to have trouble focusing at home, then you should get your home checked for mold. Now that we have discussed the signs that your home has mold from a health standpoint let’s take a look at the physical signs. If you notice discoloration of the walls, floors and ceilings, then these may be signs that colonies of mold are growing behind them. Another sign that there is mold in your walls is if the paint or wallpaper appears to have cracks or bubbles and if your walls appear to be bulging. These signs show that moisture has pierced the surface and could be carrying mold. If you cannot determine why your walls are showing discoloration or have cracked or bubbling paint, then you will want to contact a professional who will be able to determine if there is mold in your home. Since there are several varieties of mold, not every stain is going to be the same size, shape or color. Mold stains can appear as black stains, appear to be fuzzy, dark growths or appear as light and dark colored specks. You do not have to search every nook and cranny of your home to look for mold stains since they typically appear in areas that hold the most moisture and humidity, like bathrooms and kitchens. While there are several cleaning tips for removing stains, mold needs special attention to remove permanently, as it can grow back after being cleaned. If you notice any unexplained stains, then it is best to bring a professional in for an inspection. Mold is drawn to moisture. If your home has ever had a flood, a sewer back up or a toilet overflow, then it is at risk for mold. Mold can grow under the floor and behind the wall where the leaks occur. Therefore, you must make sure to thoroughly clean after a significant water disaster. It is worth noting that pipe leaks or a leaking ceiling usually create the above water problems. Where there are leaks, there is the potential for mold growth in that area. Since mold growth from leaks tends to be hidden behind walls or other surfaces, it can be entirely hidden from view. If the leak was not behind a wall or other surface, then the water could have seeped through, causing mold to grow behind the scenes. Whenever you have serious water problems or leaks, you must be cautious about signs that you have mold in your home. Related Article: What is not covered by homeowner’s insurance?